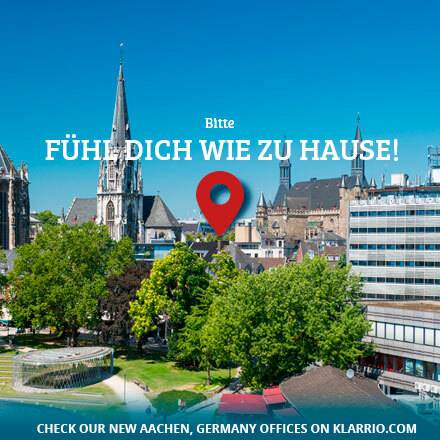 Klarrio extends its geographical reach by launching Klarrio GmbH located in Aachen, Germany. Mr. Radoslaw “Radek” Gruchalski shall act as its Lead of Engineering and brings his technical expertise and leadership after significant contributions in the field of Internet of Things and Data Engineering during previous tenures within Technicolor, Virdata, IBM, and Klarrio as well as multiple years of self-employment during which he consulted for companies like The Weather Company and Diehl Connectivity Solutions GmbH. Klarrio hereby extends its overall engineering base with nearby presence to the University of Aachen and the thriving German industry region of Aachen. Klarrio Germany will leverage Klarrio’s global capabilities and experience to deliver professional and integration services across the DACH (Germany (D), Austria (A), and Switzerland (CH)) region. Klarrio builds innovative, highly distributed, scalable and cloud native solutions on data and application platforms, integrating the latest open source software.